We would like to welcome you to stay in our charming and very comfortable home in Sunriver that is nestled among beautiful Ponderosa pine trees and sits on a 3rd of an acre providing significant privacy. 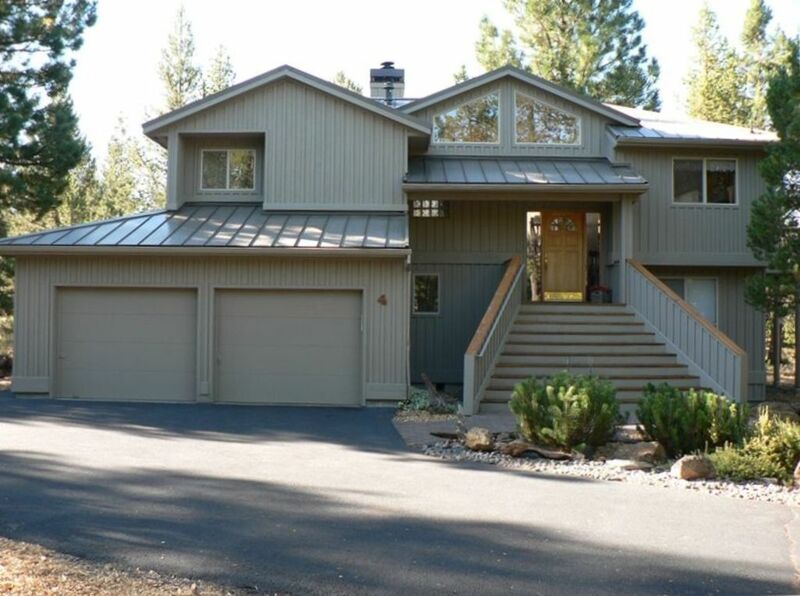 This is a quality constructed home located near Sunriver's Fort Rock Park, and centrally located between both golf courses, bike paths, and the SHARC. The home features a reverse living floor plan, which is a very comfortable open style with lots of natural light. On the main floor (upstairs) you have the living room, dining area, kitchen, one-half bath, and master bedroom. The living room has a dramatic river-rock fireplace (wood provided) with an artfully fashioned custom mantel. Open vaulted ceilings throughout the upper level, a wonderful centerpiece for the gathering together of family and friends. The cozy setting overlooks the back into the large wooded area. The dining area has seating for eight with 3 additional at the counter. You will find terrific views from every window. Especially enjoyable after a long day's exploration of the boundless, natural beauty surrounding our Sunriver vacation rental home. Directly off the dining room is the outrageous, wrapping deck with an Umbrella table, lounge furnishings and barbecue grill. From the deck, skyline views offer guests the ideal place to experience brilliant sunsets and sparkling, night skies... bright with romance and starlight. The kitchen is fully equipped with just about everything you would ever need.The Master bedroom has a king-size bed and access to the deck which will take you to the hot tub on the lower deck. DVD/VCR. You have access to the lower deck to the hot tub from a large sliding door. Off the family room is the second bedroom which has a queen-size bed and a full bath. Bedroom three is also off the family room which has a set of bunk beds, and a queen-size bed. Bathroom three is off of bedroom three and the family room. The Laundry room is off the family room on the way to the garage, where there are bikes.We also have a ping pong table. **We have 8 unlimited SHARC Passes included in your stay. This saves you hundreds of dollars with these unlimited use passes!! Access to SHARC aquatic pools, Tubing Hill, Tennis Courts. Please be our guests on Cultus Lane and enjoy the comfort of our home as well as the many activities Sunriver and Central Oregon has to offer. Each bedroom has its own bath, and the living room has a half bath. Sunriver opened a new aquatic center in May of 2013. I provide complimentary passes. Sunriver Haven is located on Cultus Lane off of circle #4. It is close to Ft. Rock Park, the new SHARC and pretty much all amenities in Sunriver as it is in the Central part of Sunriver and close to the river.